Toshiba is developing a new camera for mobile devices that will allow users to adjust the focus of shots after they're taken. The new module measures about a centimeter per side and carries an array of half a million lenses that measure 0.03mm in diameter and are positioned in front of an image sensor that spans 5x7mm. The folks at Asahi Shimbun, who first reported the camera, liken it to the way an insect's compound eye structure works. Whereas Lytro uses light-field technology for its refocusable pictures, Toshiba's solution reportedly captures a slightly different image from each lens and then it uses software to piece the 500,000 shots together. The camera can measure the distance between objects in the image -- not unlike dual lens setups that take 3D images -- allowing the user to adjust the focus around the picture or even create a photo that is entirely in focus. The new camera can also capture video with similar effects, which is something Lytro's camera doesn't offer yet. 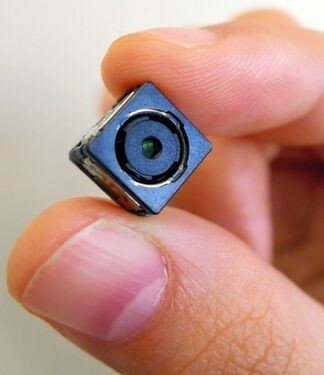 As noted, the new camera is quite small, which should allow it to be used in smartphones and tablets. The module is still being produced, but Toshiba reportedly hopes to commercialize it before the end of its 2013 fiscal year, which would be March 2014 if we're not mistaken, so don't expect it to hit shelves in the immediate future. Along with that new tech, Toshiba has also announced a 20-megapixel 1/2.3-inch image sensor -- a notch up from the 16-megapixel 1/2.3-inch solution found in many mainstream digital cameras. Along with capturing 25% more pixels, the TCM5115CL promises a 15% improvement in the charge a pixel can hold before saturating.